To make a vertical injection molding machine working fully automatic has always been a difficult task. Often the result was a complicated, single purpose system, unable to work with multiple products and difficult for maintenance. 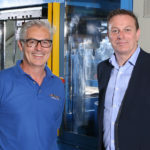 Over the last decade, industrial six axis robots have become affordable also for medium to small size companies and the development of new automation devices, universal end-of-arm tools and simplification of robot programming software have made it possible to use industrial robots also for smaller scale production. However, replacing an operator with an industrial robot very often results in lower output per hour due to the difficult nature of rubber injection molding. This becomes even more obvious when producing rubber-to-metal parts. 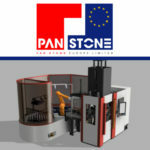 To offer an alternative to our customers, Pan Stone has developed in cooperation with our competence partner for automation, ROMI Industrial Systems, a new production cell concept. The heart of this concept is the so called MOLD HANDLING STATION, which is connected to the injection molding machine. To perform all these tasks, the automation cell needs to contain an End-Of-Arm tool magazine and the robot needs to be equipped with an automatic tool exchange system. By using single purpose tools for each task, the robot size can be kept fairly small, reducing the total foot print of the production cell and making maintenance and product changes simpler. The inserts supply for rubber-to-metal parts can be done either by using high capacity insert magazines where inserts are precisely positioned, or they can be picked directly from the containers using a 3D scanner and a bin-picking software which can recognise the parts in a container and calculate the picking coordinates for each single part. To ensure continuous quality and stable process, the cell can be additionally equipped with 2D camera systems to scan the molds for contamination and inserts for correct positioning. The whole cell is controlled with the ICON control system giving full control about the process, offering unlimited settings possibilities and delivering detailed information about the actual status, production data and machine efficiency. 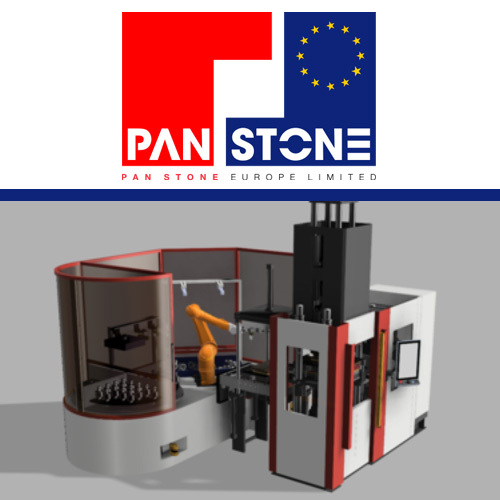 Pan Stone Europe is the exclusive European sales agency for Pan Stone Hydraulic Industries of Taiwan. 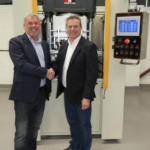 Backed with extensive experience and product knowledge, we’re at the forefront of cutting edge machinery and technology and the go-to name for the polymer industry.